Thank you, sir, for all those comfy shoes. If the name Yosi Samra rings a bell, you’ve probably seen it listed under a picture of Mila Kunis while getting a pedicure, or mentioned by Emmy Rossum during an Instagram scroll through. Remember it now? 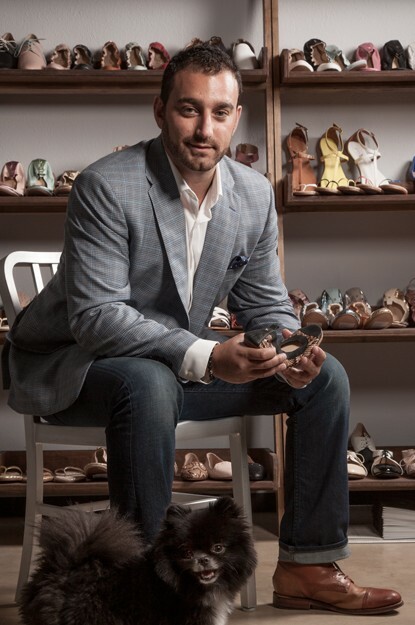 Samra is the man who pioneered every girl’s go-to footwear savior: the ballet flat. I caught up with my personal shoe hero during his visit to Fashion Industry Gallery’s Fall 1 Market yesterday to find out what we can expect from his upcoming line, his favorite shot of a celeb wearing his shoes, and, of course, to play with his ridiculously cute Pomeranian, Dexter. What can shoppers expect to see in your upcoming collection? Expect to see our classic slippers, boots and our loafers, which have been doing really well. We’re doing a lot of neutrals like army greens, nudes and fawns but we’re still playing with textures like suede and calf hair. This is also the first time we’ve ever done anything with fur. So expect fur pom-poms and shearling on the inside of the flats when cold whether comes. Which celebrity over the years were you most excited to see wearing you shoes? It’s hard, but I think for me it was Sarah Jessica Parker because she was wearing the bag and flip-flops all at once. She also apparently has a basket of the kid’s shoes available right when you walk into her house. Now that your children’s line is growing and you have your own daughter (just 2-weeks-old! ), can we expect to see that kick into high gear? We do have a shoe named Sadie right now, which is exciting, but since she’s only 2-weeks-old she’s too small to wear them. But I did make her room all ballet flats. There are ballet flats hanging underneath her changing table and I had a friend make custom artwork with little animals and kids wearing the flats. Our business is organic and all about word of mouth, so our kids line will probably go into full gear now that we have a little Sadie Samra. What do you think it is about your shoes that makes me people so addicted? Honestly I just think it’s the comfort, the quality and the overall value. You’re getting a fun, functional product that you can take with you wherever you go. You can have multiples for each season and it won’t break your bank account. What is the essential Yosi Samra shoe every girl should have in her closet this spring and summer? I love our camouflage. We have a pink and a grey camo along with your typical army green that we did in our flip-flops and ballet flats. Those are my favorite and some of our top sellers. They’re fun and easy and go with everything. What can we expect to see from Yosi Samra in the upcoming months? All the new styles that we’ve launched like the boots and the loafers have done really well but nothing compares to what we do best which is our ballet flats. We plan on taking it back to where I started and are working towards evolving our ballet flat collection and think outside the box. You’ve lived here [in Preston Hollow] for about two years now. Why did you make the move to Dallas? A girl, quality of life, and just a love for the city.